Sudan Election or Confusion ? To Delay or not to Delay for whom for Beshir or Opposition ? 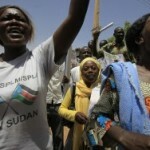 Where are Sudanese Women ? The whole world is confused Delay or Not Delay there is no more time ? Nairobi, Kenya (AHN) – The United States is advising Sudan to delay the country’s first multiparty election set for this month. “We recognize that a short delay might be needed, but any delay should be used so that Sudan can get better this election and deal with opposition parties legitimate misgivings” said State Department spokesman P.J. Crowley on Monday. Crowley added that Sudan should make sure the election are peaceful, credible and transparent. In 2005 the northern and southern regions signed a peace agreement in Kenya that ended 21 years of civil war. April 4, 2010 (KHARTOUM) — The US special envoy to Sudan Scott Gration came under fire from opposition leaders after he gave his blessings to the April elections to go forward and expressed confidence that they could be held in a credible manner. “They [National Election Commission] have given me confidence that the elections will start on time and they would be as free and as fair as possible,” Gration told reporters. “These people have gone to great lengths to ensure that the people of Sudan will have access to polling places and that the procedures and processes will ensure transparency. This has been a difficult challenge but I believe they have stepped up and met the challenge ” he added. The remarks by the US official has shocked many in Sudan particularly those opposed to the ruling National Congress Party (NCP) who felt that the world power has betrayed them. “So he went to the Election Commission and they assured him that they are fair and unbiased. It is like asking a thief to swear he is honest and then believing him” a 26-years old student in Khartoum by the name of Khalid told Sudan Tribune. “The US wants the [National] Congress Party to stay in power because they are the only ones who are willing to give them concessions. Obama turned out to be no different from Bush. We, the ordinary Sudanese will pay the price for this selfish policy” he added. The former prime minister and leader of the Umma Party Al-Sadiq Al-Mahdi described Gration as “naive”. “The U.S. position has two things in it. There are those who adopt a view that represents the American right which is close to Israeli thinking that says that [Sudan] must be dismantled to weaken Sudan – like the other Arab countries – in the face of Israel. There is Larry Soler of the Heritage Foundation advocates of this view and support the secession of southern Sudan and escalating the crisis in the Darfur issue and in this view, the victory will help the National Congress [Party] on the scenario of breaking up Sudan” Al-Mahdi told the Qatar based Al-Jazeera TV today. “There are other people good intentioned but naive as Gration. He has already came here and exchanged views with political forces, but he could not because he failed to diagnose the problem and could not deal with the problem between the two partners, after his many attempts and shuttle visits and now when it came to the question of the elections did not affect anything in the meaning in both cases [he] failed” al-Mahdi added. Al-Mahdi said he is puzzled why the US insists on holding credible elections in Iran while not doing the same in Sudan. This week the Umma Party in its declaration that it intends to boycott elections unless certain conditions are met said that Gration promised Al-Mahdi during his meeting with him that he will press the NCP on postponing elections which has been the central demand of opposition parties saying reforms are needed to ensure the polls are fair and free. The NEC has been accused by opposition of violating the electoral law and favoring the ruling party in its conduct and decisions. The ruling National Congress Party (NCP) has strongly rejected any delay to the polls threatening Southerners to push back the 2011 referendum if the join the calls for postponement. Incumbent President Omer Hassan al-Bashir of the ruling National Congress Party (NCP) who is running for re-election wants to win the elections to legitimize his rule, in defiance of an International Criminal Court (ICC) warrant for his arrest for war crimes in Darfur, after a brutal counter-insurgency campaign begun in 2003. The Umma Reform and Renewal Party (URRP) leader Mubarak Al-Fadil issued a strongly worded statement today slamming the US special envoy. “We in the Umma Party and the Sudanese National Consensus Forces have made it clear to Mr. Scott Gration that the elections that the National Congress Party insists to impose on April 11, 2010 are partial and farcical elections devoid of the minimum fundamental requirements of a free and fair election” Al-Fadil said in his press release. “Gration deliberately disregarded the fundamental articles of the Comprehensive Peace Agreement, to which the United States is guarantor, that stipulate the restructuring of state organs and the abrogation of all laws contravening the bill of rights founded in the CPA and enshrined in the Constitution”. Al-Fadil recounted what he described as breaches of the electoral process done with the collaboration of the NCP and NEC which according to him were ignored by the US envoy. “Gration has ignored the serious revelations of the Carter Center’s report outlining grave irregularities in the electoral registry; the National Election Commission’s refusal to hand over the electoral registry for audit and their reduction of the total number of polling stations by 60%, constraining access to those voting for non-NCP parties. This information was overlooked by the Special Envoy together with that which was given by the opposition forces concerning the Electoral Commission’s transfer of the tender award for ballot card printing from the international firm which was the legitimate winner of the tender to the NCP-controlled Sudanese Currency Printing Press, placing the entire election process in the hands of the NCP. Mr. Gration has failed to heed the opposition’s warnings about the blatant bias of the Electoral Commission towards the NCP and has chosen to ignore our caution regarding the fragile political and legal environment in the country; the dispute over the population census; and the shaky state of security in Darfur and continued state of emergency together with renewed violence in the area; all of which stand to hinder the election process and reduce its legitimacy”. “Gration continues, in the name of the United States of America to publicly advocate this flawed election, defend the Electoral Commission and the NCP, leading President Omer El-Bashir to “laud the position of the United States in support of the NCP”. This week the Sudanese presidential assistant Nafie Ali Nafie expressed his gratitude to Gration for his commitment to hold the elections on time and his understanding that the polls are crucial for the stability of the country and that the NCP will not allow for a national interim government to run the country until the elections are concluded. In a related development, the Umma Party appeared poised to run in the elections despite assertions that they want the government to respond positively to a set of demands. The Umma Party said after a lengthy meeting on Friday that their participation in next week’s poll is contingent upon fulfillment of eight conditions which include ensuring the neutrality of the media and freedom of access to it by all political parties, government funding of election campaigning, prohibiting the use of government resources by any party, regulation and determining a specific ceiling for campaign financing and spending, recognizing that elections in Darfur region will be incomplete and creating a body to oversee the work of the NEC. Furthermore, Al-Mahdi’s party demanded that the right of South Sudan to hold the 2011 referendum as planned should not be subject to negotiations or political maneuvering. The party said that should the government agree to the aforementioned terms, the elections must be postponed till next May which is different from the original date proposed by opposition parties which falls in November. But today Al-Mahdi softened its stance saying that the government responded to 80% of its demands and that they are negotiating the remaining 20%. Nafie today said at the NCP headquarters said that opposition parties will have no choice but to take part in the elections “after losing the external support”. The parliamentary, local and presidential elections are a crucial step in the 2005 north-south peace deal that ended a 21-year civil war and paves the way for a referendum when southerners would decide whether they will opt for secession from the Muslim-dominated north.